One of the most time consuming parts of blogging can be pictures. More often than not there is need to perform bulk actions on a range of images. You have no idea how tedious it can be taking your photos for your blog and having to, one by one, manually resize them into something more manageable. This takes time and to say it’s a tedious task is an understatement. So when we came across Image Bucket we were ecstatic. Image Bucket takes the hassle out of doing tasks like resizing, watermarking and renaming by batch processing your images. To say it’s simple to use and a time saver is an understatement. 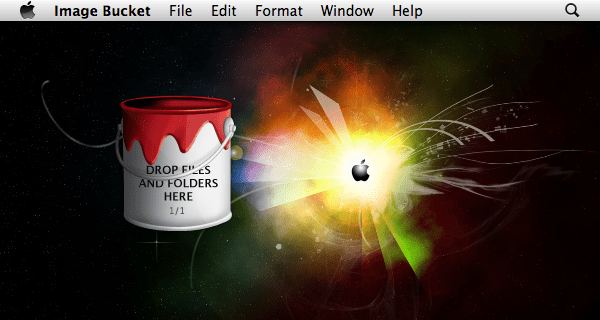 To start simply drag and drop your files from wherever onto the bucket. The bucket expands to show you the available options. It’s all self explanatory as you can see so let’s use the images to do the talking. A top tip here. Save your files in a different location. Backups are your friend 😀 Thankfully the warn before overwriting feature is ticked as default to stop those happy clicking fingers. The transform window gives you the basic image resizing options along with the preview window which is a god send, helping you make sure that the aspect ratio is correct. The 2 arrows let you shuffle back and forward through the dropped images. With simplicity in mind the watermarking feature works with text only. If it had let us use a logo, select the transparency then overlay onto the images that would of been the icing on the cake. Quite honestly this app really did save us some time when doing our reviews this week and with usage we’ve found some annoyance that “other” review sites have missed. The first major annoyance comes when images have been dropped into the bucket and the dialogue appears it’s stuck in that position leaving you unable to move it around the desktop. This proved frustrating when lining up screen grabs for the review. We would have liked the ability to go back into the set of processed pictures we had just bucketed. For example, dropping 10 images, editing and transforming you run the process but then spot an error. You can’t simply re run the batch again. You have to re drag the files and then make the changed. Thankfully all dialogue boxes retain their settings so it’s just the dragging and dropping that needs to be done. Hopefully a future revision will change this. A fantastic little application that makes “App Of The Day” within moments of usage. We’re adding it to the Essential Mac Apps list immediately. 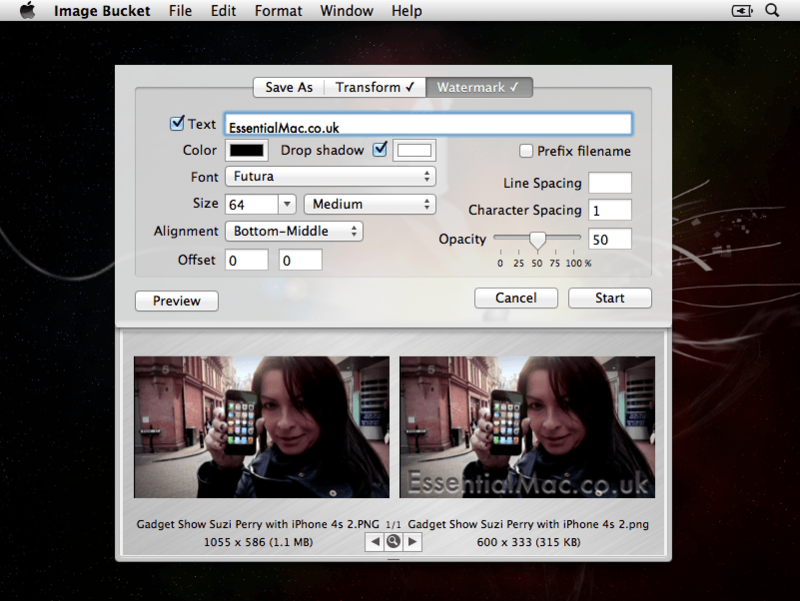 Image Bucket Version 1.6 has been released with several UI enhancements including the new feature, Image watermarking. Enhancement: reduced peak memory usage by up to 80% (under certain conditions). Enhancements: increased photo processing speed. UI tweak: reposition progress indicator. 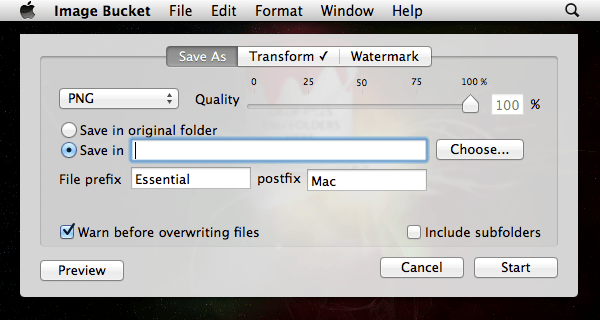 Bug fix: image watermarks and they persisted in mountain lion. Bug fix:retina displays and Now supported. Bug fix: when meta data is not persisted, JPEG file sizes are now smaller was keeping the same level of image quality. New feature: The width of a watermark image can now be specified as a releative % of the image being modified. Bug Fix: Fix crash related to navigating through preview images.